There's good unpleasant (Before the Devil Knows You're Dead, Margot at the Wedding) and then there's dreck like this - the Farrelly Brothers' trashy, shrill "romantic comedy" (a remake of the 1972 film of the same name) about a guy who marries the wrong girl, but doesn't find out until the honeymoon where she turns into a completely different person, and he falls for another woman. Not every movie has to be a pleasant experience, but The Heartbreak Kid is so annoying, so painfully unfunny that it borders on torture. Movies just don't get much worse than this. Speaking of torture, who needs waterboarding when you have Love in the Time of Cholera, Mike Newell's woefully ill-conceived and miscast adaptation of Gabriel Garcia Marquez' Pulitzer Price winning novel? 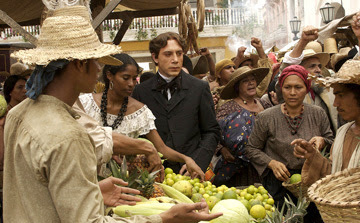 In what has to rank as one of the worst literary adaptations ever, Love in the Time of Cholera is the year's most interminable sit - an aimless, overlong, pretentious mess of a film about a man whose unrequited love spans over 50 years...which is how long this movie feels. Laughably bad makeup effects don't help matters either. Newell squeezes all the romance and emotion out of Garcia Marquez's text in favor of a dry, laborious, literal-minded take that plays like the movie that never ends. As a fan of the popular Comedy Central TV series, I had high hopes for their first foray onto the big screen. Alas, instead of the film's usual razor-sharp satiric humor, I was greeted instead with a cast newly free or network restrictions bent on stretching their legs with as much gross-out humor as possible. It's tolerable in 30 minute intervals...a full length feature is just too much. Not funny by a longshot - give me the TV show please. Probably the goofiest entry into the recent spat of superhero films trying to capitalize on Spider-Man's success, Rise of the Silver Surfer is not only one of the worst acted films of the year's its also one of the dullest. Which is surprising...movies where the world is in danger of eminent destruction should not be boring. But it is...not to mention ridiculous. Lacking the emotional core of the Spider-Man films and the visual pinache of the Batman franchise, this superhero sequel just doesn't cut it. After the feverishly intense Hard Candy, I had high hopes for first time director David Slade. Then he came out with this, a bland, uninteresting vampire thriller about a clan of ancient vampires laying siege on a tiny Alaskan town during a 30 day span in which the sun will not rise. A promising premise is done in by laughable dialogue and myriad plot holes in a film that just doesn't add up to anything worth seeing. Slade's obvious visual flair can't even save this poorly constructed attempt at horror. Good list, I feel bad for Love in the Time of Cholera, it could have been a great film, everyone originally thought it would be, but oh my were we all wrong!!! "You Are Now Free to Move About...Detroit?" AFI Names 2007 "Moments of Significance"
Jonny Greenwood's "There Will Be Blood"
Review: "National Treasure: Book of Secrets"
Angela Lansbury - "Not While I'm Around"
Knee-jerk Reaction to "The Kite Runner"
Clip of "Raise it Up" From "August Rush"
Review: "Margot at the Wedding"
Del Toro for "The Hobbit?" Austin Film Critics Honor "There Will Be Blood"
Knee-jerk Reaction to "Lady Chatterley"
No Screenplay Nom for "Michael Clayton"
Review: "For the Bible Tells Me So"
Is "The Kite Runner" the "Crash" of 2007? Review: "Great World of Sound"